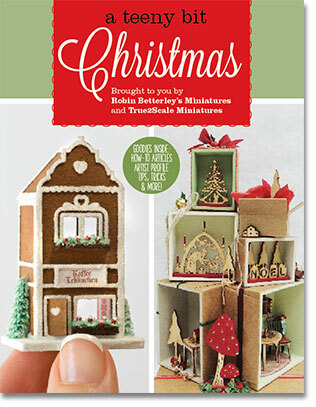 This free, online magazine is the result of a collaboration with Robin Betterley's Miniatures. We wanted to work on a project that not only showcased our miniature art, but also gave us the opportunity to incorporate other creative interests: writing, photography, cooking, etc. In addition to delivering fun and unique projects to a teeny bit readers, we want to promote the work of other professional miniature artists, so we included an artist profile of Suzanne and Andrew’s Miniatures. It's been a tremendously fun and creative group effort. We are offering a teeny bit magazine in hopes that it will inspire you to... Make something teeny! View the magazine online for free OR Purchase a printed copy.